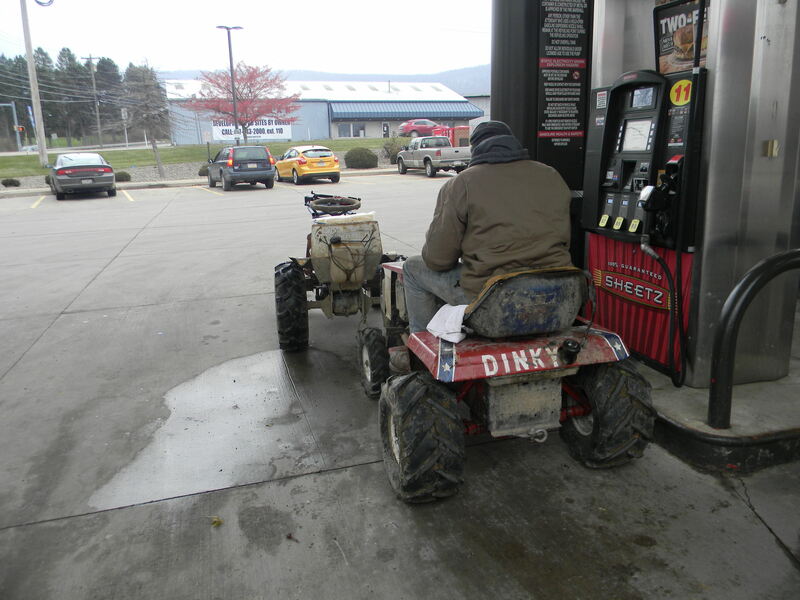 this is a rap song i made about mudding tractors, because i said i could, so i did. its a good compilation of some fun moments to. I have to say.... i was afraid to play that. Turned out pretty good! EXCITED TO SEE MORE VIDS AND COPY YOUR LOCKER! nice I like watching the vid of working in ffwd.... what did you do when you took off the flywheel? huh, and i was worried i should of deleted thoes clips if i needed to fast forward threw them. i did not want to play music as we all got diffrent taste. i was taking the fly wheel off to properly swap out the starter, but or my firend never pressed record on the camra or did not let the camra have a proper start up time. i dont think it was me but it could of been, i was quite distracted. But Dinky looks like its perofrming great! i just welded in a little square of metal to block off the nutrual position. because of gravity there is no longer any place for it to catch unless the tractors on 2 wheels or upside down, witch should not be to often thats a problem. a bit off topic, but whats the deal with the discord server? im considing leaving it for being horribly inactive. id like to add that i plan on straightening out the old axle, cutting it to normal lenth, and using it for locking a rear on the redneck mower. im getting a new axel for dinky, and im getting much thinner angle iron this time around and cut it how i did my second time fixing it, im getting full penetration out of my welder this time. all in all, i dont see what i did before as a loss, i learned from it and its forcing me to ripka lock another trans. I really hope the Luck is on your Side this time!!! 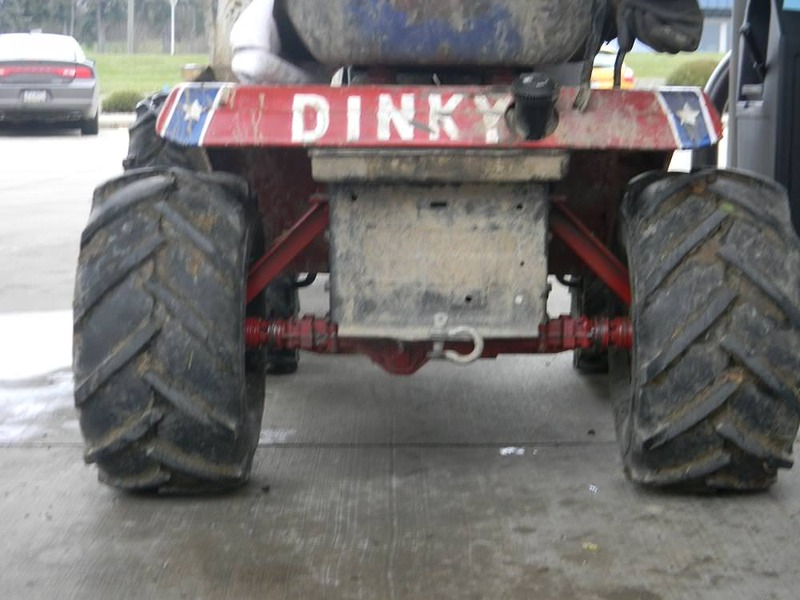 I love Dinky beating the Mud Holes! & I enjoy all your Vids too! 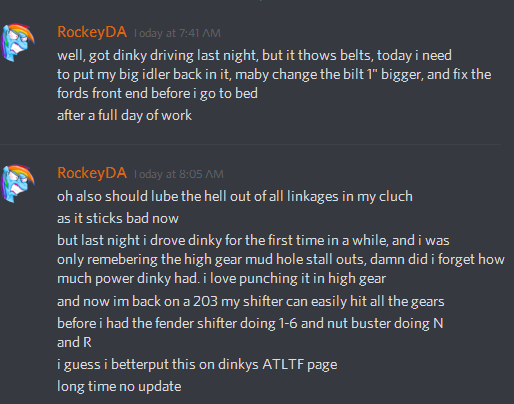 had dinky driving for less than 1 day. videos kinda long, there will be a shorter one and pics to come of dinky lator on in the week. R U gettin a new Engine for the Mud Train now? ile keep my eyes open, but this motor runs till it blows up.